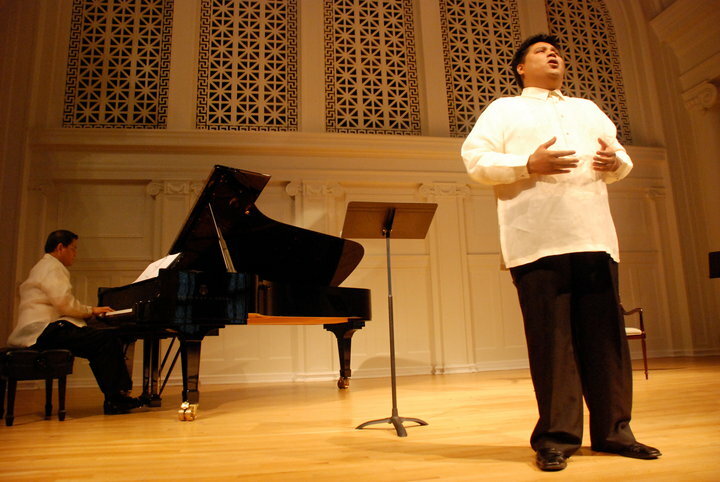 EVANSTON, Ill — Kundiman is a traditional Philippine music genre that centers on relationships and romance. It is written in Filipino language, and its melody is described as flowing and gentle. In the old days, it was sang to woo a lover, or ask someone in marriage. 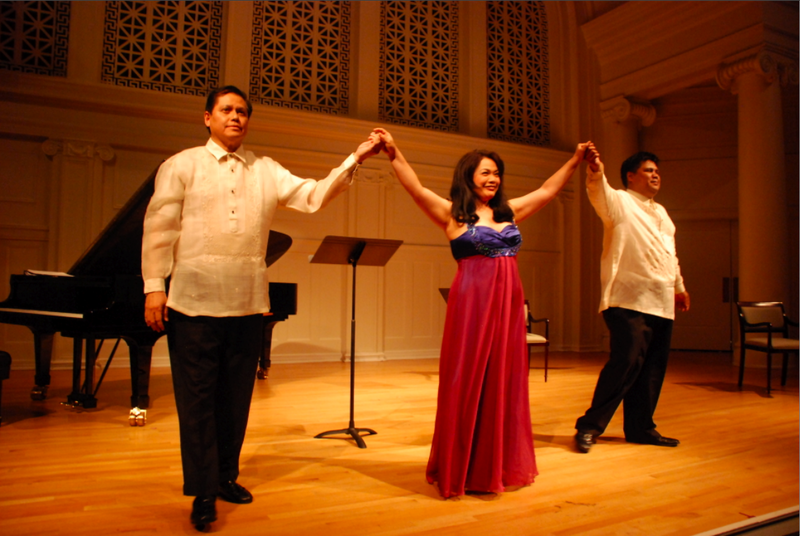 Last Saturday, August 21, three classically-trained Philippine artists put kundiman to a new light, in a rousing performance at the Nichols Concert Hall in Evanston, north of Chicago. Juilliard-trained mezzo soprano Clarissa Ocampo teamed up with award-winning baritone Andrew Fernando, and another Juilliard alumnus and distinguished pianist Raul Sunico, in staging Ang Pag Ibig Mo: A Philippine Love Cycle. 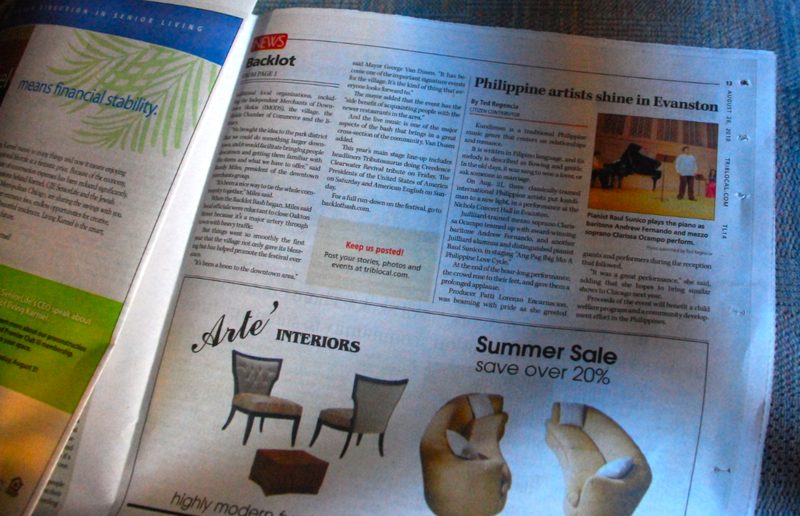 The predominantly Filipino audience, which includes the newly-designated Philippine Consul General Leo Herrera-Lim, was treated to a rare performance that does not include pop star Charice, or Filipino heartthrob Piolo Pascual. 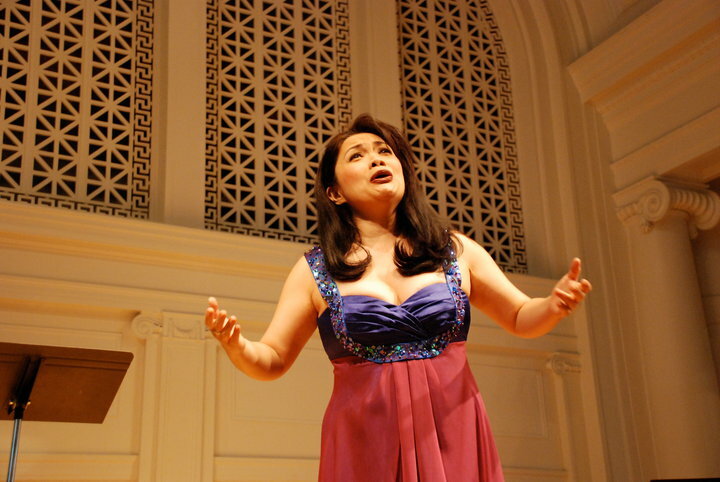 Like a Carnegie Hall veteran that she is, Ocampo gave an expressive and sparkling interpretation of Bituing Marikit (Dainty Star), by pre-World War II Filipino composer Nicanor Abelardo. Resplendent in her golden maroon and metallic purple gown, Clarissa Ocampo’s voice fluttered in the air like a feather. The Neo-classical Nichols Hall, originally built in 1912 as the First Church of Christ, Science was the perfect venue for Ocampo’s Chicago debut. The 550-seater hall’s excellent acoustics accentuated Ocampo’s powerful voice. Her every enunciation of the Filipino lyrics sounded like an Italian aria. Not surprising, considering that she played Flora Bervoix in Verdi’s La Traviata at the Singapore Lyric Opera. Even Ocampo’s rendition of the contemporary classic Ikaw Lamang of another Filipino artist, Dodjie Simon, did not sound out of place. Accompanying her on the piano, the elegant Maestro Sunico, artistic director of the Cultural Center of the Philippines and dean of the University of Santo Tomas music conservatory, was a work of controlled mastery. Sunico, who’s performance of Ravel’s Ondine and Le Gibet at the Alice Tully Hall in New York was praised by New York Times as “handsomely colored”, commanded the piano without seemingly breaking a sweat. Meanwhile, Fernando, the third member of the trio emphatically proved why he was hailed by the Los Angeles Times as “the young singer to watch.” The 2003 First Prize winner of the prestigious Loren L. Zachary National Vocal Competition summoned the audience’s attention without overwhelming them. Fernando’s version of Ikaw by Louie Ocampo captured the composer’s pining for love, injecting it with operatic flair. 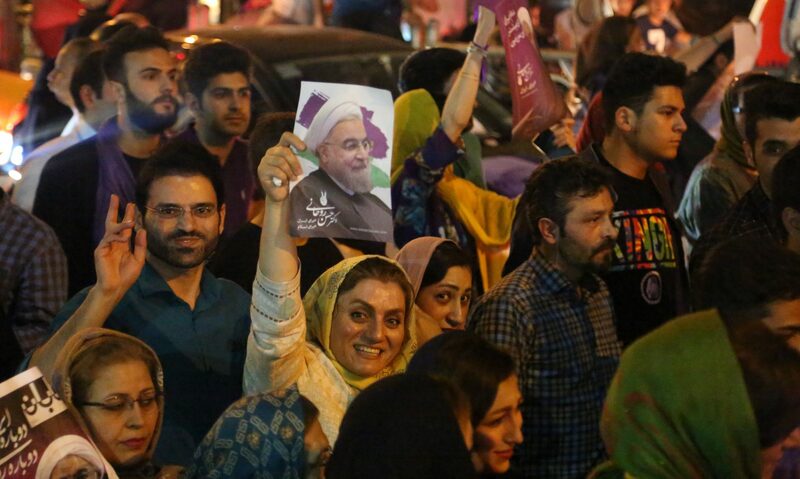 At the end of the hour-long performance, an obviously charmed crowd rose to their feet, and gave them a prolonged applause. Even non-Filipinos who watched the show appeared impressed with the quality of the all-Filipino language performance. Producer Patti Lorenzo Encarnacion, an Art Institute of Chicago graduate was beaming with pride as she greeted guests and performers during the reception that followed. “It was a great performance,” she said, adding that she hopes to bring similar shows to Chicago next year. Proceeds of the event will benefit the child welfare program of Bantay Bata and the community development effort of Gawad Kalinga in the Philippines. Next postCash lifeline cast from the U.S.